Since 1973, The Emmanuel Gallery, located on the Auraria Campus in downtown Denver, exhibits the work of exceptional artists from Colorado and around the world. The Emmanuel is a non-profit art facility committed to enhancing the understanding and experience of the visual arts. Through the presentation of significant art exhibitions, lectures and events our purpose is to encourage critical thinking, creativity, and meaningful exchange between artists and audiences. Programs at Emmanuel Gallery promote education, empathy, and creativity to the diverse cultural community of the Auraria campus and the Denver metropolitan area. The Emmanuel Gallery was honored as a recipient of the Denver Mayor's Award for Excellence in the Arts and Culture. The Mayor’s Award for Excellence in the Arts & Culture annually recognize individuals and organizations that have made significant and lasting contributions to the arts in the City and County of Denver. Emmanuel Gallery's exhibitions are always free and open to the public. Call 303-315-7431 for more information or emmanuelgallery@ucdenver.edu. The gallery is within walking distance from the 16th street mall and the bustling LoDo district at the heart of Denver's art community. Built in 1876, the Emmanuel Gallery is Denver’s oldest standing church structure. 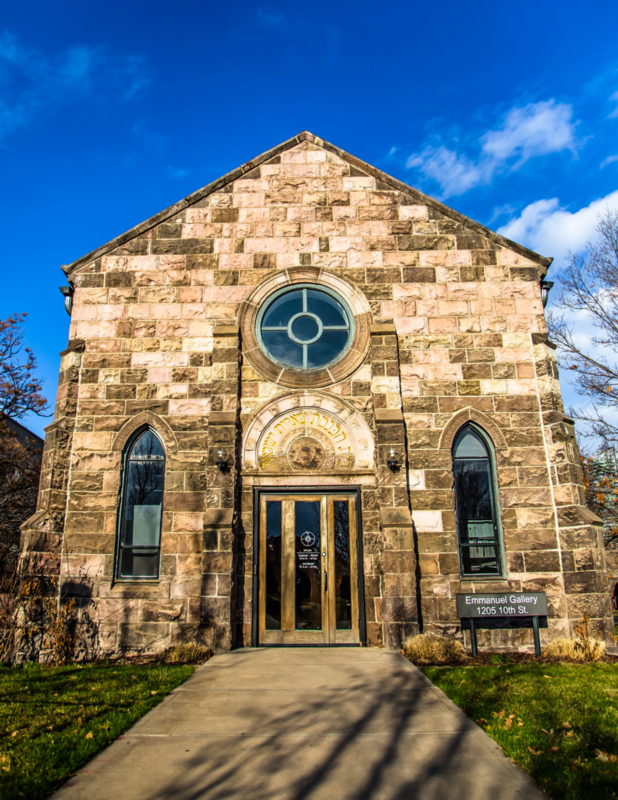 In 1969, the Emmanuel Chapel was approved for listing on the National Register of Historic Places and was also the first building listed as a historic site by Denver's Landmark Preservation Commission. In 1973, Emmanuel became part of the Auraria Campus –which includes the University of Colorado Denver, Metropolitan State University of Denver, and Community College of Denver. It has since been remodeled for use as an art gallery and is managed by the University of Colorado Denver. In 1874 Bishop John F. Spaulding purchased the land that had been the site of an older religious building, a non-denominational Sunday school built by Col. Lewis N. Tappan in 1859. In 1876, Bishop Spaulding built an Episcopalian Chapel, now the Emmanuel Gallery. As the neighborhood grew, in 1903 Emmanuel Episcopal Chapel was purchased by the congregation of Shearith Israel and converted to a synagogue. Throughout the early years, Emmanuel Shearith Israel Chapel served the developing Jewish community and became affectionately known as the Tenth Street Shul. For over half of a century, the synagogue served the Jewish community. As members of the congregation moved to other neighborhoods, in 1958 services ended and the Shearith Israel Synagogue was sold. From 1958 to 1973, the owner Wolfgang Pogzeba used the church as an artist’s studio. Mr. Pogzeba updated the electrical and plumbing systems and, except for replacing the original wooden doors with bronze doors, respected the historical integrity of the structure. Though the facility was upgraded in 2006, very little of the original architecture has changed. The building is constructed of stone with 12’ x 18” wall buttresses. The architectural style is a combination of Romanesque and Gothic influences. Windows in front and along the sides have pointed Gothic arches. Originally rose windows existed in the front and back walls. The building measures 24’ x 66’. When it was converted from an Episcopalian Chapel to a Synagogue the interior was changed very little, though a balcony was added and the ceiling was re-plastered and rounded.